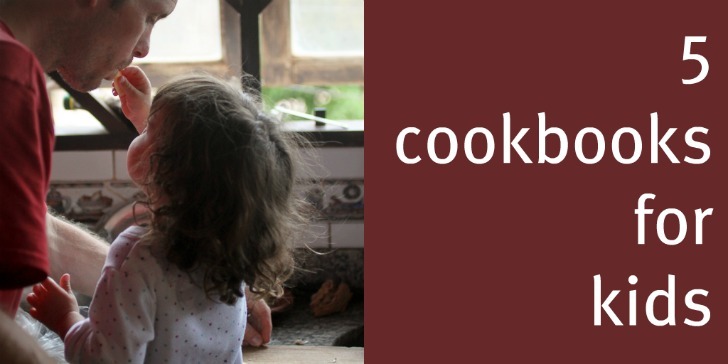 If you're the type of parent that likes to cook, chances are your children are curious about cooking as well. Cooking with kids is not always easy, in fact it's almost always hard, especially if you're trying to get dinner done, the kids fed, the dishes washed, and the kids in bed. My bookshelves are packed to the brim with cookbooks and more than once I've caught my kids sitting down with a heavy cookbook on their laps, looking through pages and pages of recipes. 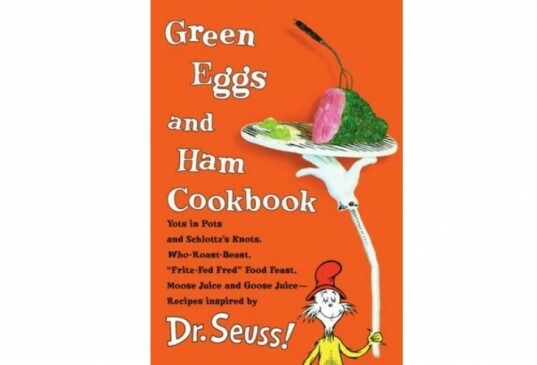 Then I decided to get my son his first cookbook, Green Eggs and Ham Cookbook, as a Christmas present and he loved it. He was so excited to have his own cookbook. I decided to make it a point to have him cook, with my help of course, once a week using recipes he wanted to try. We plan ahead, we start early, and we have fun. Since last Christmas we've added a couple of other kids' cookbooks to our collection. Here are our five favorites, maybe some your own children will enjoy. This little cookbook, with simple and quick recipes is one of our favorites. We use Bean Appetit as a resource more than anything, to get ideas for fun things we can do with food. Recipes usually call for whole wheat or unbleached flour, brown sugar, and lots of fruits and vegetables. I find that if Enzo, my 5 year old, makes dinner, chances are he’ll be more excited about eating it. In other words if he’s making something with vegetables I usually won’t have to argue with him to try it. Ideal for children 3 and up. 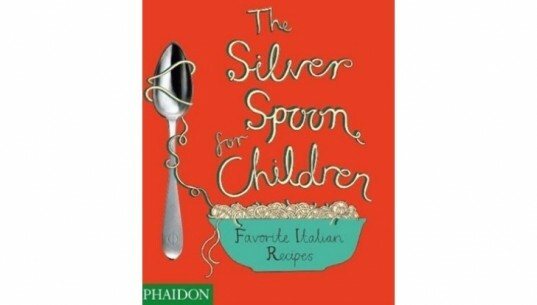 The most well known and celebrated Italian cookbook, The Silver Spoon, now has a kids’ version, The Silver Spoon for Children, and it is fantastic. Even when I’m not cooking with my kids I use this cookbook for myself. It is extremely well written, easy to follow, and beautifully put together . Every recipe is fully illustrated so even if your child does not know how to read they can still follow along. Not only are the recipes tasty and easy to prepare, they are also informative. Each recipe has a short introduction of the dish, a description about the ingredients, and snippets about Italian culture. Ideal for children 5 and up. One of our favorite vegetarian cookbooks is the Moosewood Cookbook, named one of the New York Times top ten best selling books of all times. If the Moosewood Cookbook is part of your personal library then add Honest Pretzels to your children’s library, I bet it will quickly become treasured. All of the recipes are illustrated, making it easy for kids of all ages to enjoy. There are simple recipes like maple-yogurt-dip to more advanced recipes like spaghetti pie. Ideal for children 4 and up. Chez Panisse is a famous restaurant in Berkley California that has been serving local, organic, and sustainable food since 1971 founded by food activist Alice Waters. Fanny at Chez Panisse, is narrated from the point of view of Fanny, Alice’s daughter. Not only does this cookbook have simple recipes with basic ingredients, it also has snippets of what it’s like to be a part of a busy restaurant life. Ideal for children 8 and up. One of my favorite things about Dr.Seuss is his food references, his creative food references that is. Who hasn’t wondered what green eggs and ham tastes like? I know my children have. I know I have. That’s why we love this book because it’s a great companion to some of our favorite Dr. Seuss stories. Ideal for children 5 and up. This little cookbook, with simple and quick recipes is one of our favorites. We use Bean Appetit as a resource more than anything, to get ideas for fun things we can do with food. Recipes usually call for whole wheat or unbleached flour, brown sugar, and lots of fruits and vegetables. I find that if Enzo, my 5 year old, makes dinner, chances are he'll be more excited about eating it. In other words if he's making something with vegetables I usually won't have to argue with him to try it. Ideal for children 3 and up. The most well known and celebrated Italian cookbook, The Silver Spoon, now has a kids' version, The Silver Spoon for Children, and it is fantastic. Even when I'm not cooking with my kids I use this cookbook for myself. It is extremely well written, easy to follow, and beautifully put together . Every recipe is fully illustrated so even if your child does not know how to read they can still follow along. Not only are the recipes tasty and easy to prepare, they are also informative. Each recipe has a short introduction of the dish, a description about the ingredients, and snippets about Italian culture. Ideal for children 5 and up. One of our favorite vegetarian cookbooks is the Moosewood Cookbook, named one of the New York Times top ten best selling books of all times. 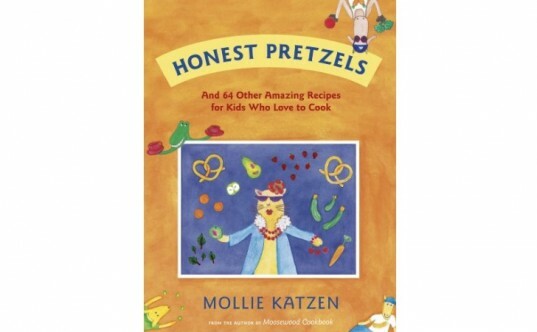 If the Moosewood Cookbook is part of your personal library then add Honest Pretzels to your children's library, I bet it will quickly become treasured. All of the recipes are illustrated, making it easy for kids of all ages to enjoy. There are simple recipes like maple-yogurt-dip to more advanced recipes like spaghetti pie. Ideal for children 4 and up. Chez Panisse is a famous restaurant in Berkley California that has been serving local, organic, and sustainable food since 1971 founded by food activist Alice Waters. 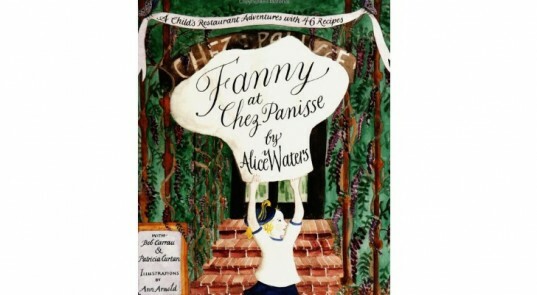 Fanny at Chez Panisse, is narrated from the point of view of Fanny, Alice's daughter. Not only does this cookbook have simple recipes with basic ingredients, it also has snippets of what it's like to be a part of a busy restaurant life. Ideal for children 8 and up. One of my favorite things about Dr.Seuss is his food references, his creative food references that is. Who hasn't wondered what green eggs and ham tastes like? I know my children have. I know I have. That's why we love this book because it's a great companion to some of our favorite Dr. Seuss stories. Ideal for children 5 and up.